Online pure player boohoo.com is a fashion retailer from the UK which has become a well-known brand not only in Great Britain but here in Australia, too. Founded in 2006 by Mahmud Kamani and Carol Kane, the fashion store addresses primarily young women who love fashionable clothing. It all began with dresses for young ladies. However, boohoo.com now covers a much broader range of clothing items, e.g. menswear, shoes, and accessories. Today, fashionistas from over 100 countries worldwide can buy the latest on-trend fashions and own brand clothing in boohoo.com’s online store. boohoo is, amongst others, also localized available in French, German and Spanish. What boohoo.com sets apart from their competitors are three things. First, makers of boohoo put a strong emphasis on understanding you, their customers. Co-Founder Carol Kane has worked in the fashion market for almost all her professional life. She and her team always know, what you are looking for – based on your lifestyle and budget. Second key to success is a really lean and fast clothing production process. It takes your new dress only 4-6 weeks from a designers drawing board to your wardrobe. This extraordinary fast production cycle enables boohoo.com to add dozens if not hundreds of new styles each day. Third, boohoo.com is a truly international brand. Shopping with boohoo.com is your guarantee to actually dress up with the latest styles from Europe and the U.S. and so you always stay ahead with the trends. But what are customers actually saying about boohoo? Reviews on sites like Trustpilot and ProductReview.com.au vary from excellent to not so excellent. Most negative ratings of the online retailer refer to imperfect customer service. Maybe, boohoo.com has become victim of their own success. As a fashion retailer, returns can reach really high numbers. To remain a profitable business, online stores need to automate and streamline delivery and return processes. Unfortunately, individual customer support sometimes falls by the wayside. This can be the downside for providing excellent prices, deals and offers. How to save with boohoo.com promotional code? boohoo.com is about 24/7 fashion. Up to 100 styles are added every day. If your love for in vogue fashion stresses your purse a bit too much from time to time, why not save with exclusive promo codes for boohoo.com Australia? 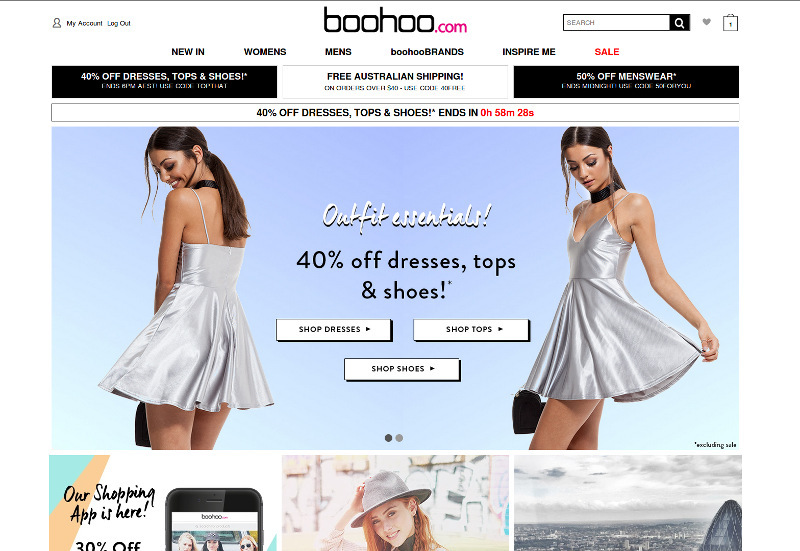 boohoo.com makes extensive use of promotional codes, special deals and sales for their customers. Just make sure that you always start your shopping here at CouponDeals.com.au and don’t miss any of their sought-after discount codes. So, saving with boohoo.com coupon codes is as easy as this: Check out boohoo.com’s latest deals and offers in our collected list above. 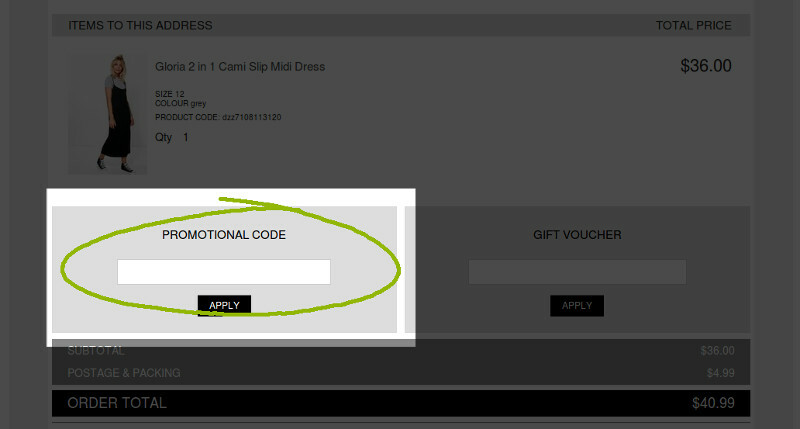 Retrieve the coupon code of your choice as described, copy it to your clipboard and click the button to be sent straight to boohoo.com’s website. The promo code will remain in the clipboard of your computer or mobile device. At check out on boohoo.com, follow the steps as described there. Step 4 is entitled Order Summary. This is where you will find an input field labeled Promotinal Code. Paste your coupon code right into this field and hit Apply. Your savings will appear instantly on the total price. Happy shopping! Check back with CouponDeals.com.au and boohoo.com regularly as they add a hundred+ brand new styles per day! Being a pure online retailer, boohoo is extensively using social media to connect with their audience and show fashion insides. At YouTube, the fashion store operates their own channel. Here you can watch behind-the-scene reports as well as interviews with models, and of course tons of look and style inspirations. Up to 50% off Absolutely Everything + an extra 10% off!